Although most people talk about how tedious the moving process is (and we do too), they often forget another very important aspect of the whole process – the post-move situation. It can be just as stressful, especially if this is your first time moving. So what can you do? Today we are going to look over some of the essential items you may need when you get to a new place. This guide is going to be handy for a lot of you, but we are mainly aiming at people who are new to moving. As Chicago movers we have plenty of experience and want to tell you what you should definitely figure out as soon as (or even before) you move! 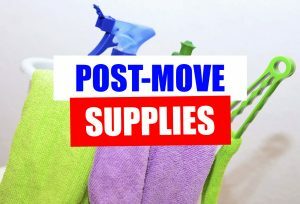 You can pretty much do without most things in your home, but you cannot really come up with impromptu solutions when you need bathroom supplies. That is why it is best to stock up on them even before the move. You would want to take a nice shower and relax as soon as you move, but you won’t be able to do that, if you have no bathroom supplies. So don’t forget to buy some soup, shower gel, shampoo, conditioner and even toilet paper. You’d be surprised how many people actually miss details such as these. Don’t make that mistake! But aside of the obvious supplies, you would also need other things too. For example, a lot of people would not go without a toilet brush and a trashcan. You may also consider buying additional towels, although that is not strictly necessary. If you care about your health at all then you should want to learn how to cook for yourself. But the food supplies we have in mind have nothing to do with what you would have for dinner tomorrow or a day after that. Instead we mean all the little things that you would need when cooking. Even if you are not a cook, you may still want to have things such as sugar, flour, spices, cocoa and similar things around. You never know when some inspiration may hit you. So stock up on tea, coffee, rice, beans and stuff that can last you a while. It is always nice to be able to prepare a quick dinner whenever you need it. If you did not already think about it – you also need stuff to cook with. So buy yourself a set of pots, pans, cutlery and other things you may need for that. Of course, after you are done with taking a bath and preparing yourself a nice warm dinner, you would want to clean up. However, you won’t be able to do it if you have no cleaning supplies, right? Many people neglect the necessity of stocking up their cleaning cabinet, but you shouldn’t! It is much better to spend some time to make sure you are not living in an utter mess. So go out there, buy some cleaning sprays, detergents, dish soap and other items you may need!